You might think that during the holidays, people would be in a good mood. I am (I mean, I was). 2010 was a good year, and things truly started to make the turn from a hiring standpoint. I didn’t say we were there yet – only that things are looking better. Much better. 2010 was one of our better years. Historically, December has always been a good month for us. Candidates were (generally) available to interview in late December despite the challenges associated with scheduling during the holidays and the God-awful cold weather we’ve experienced. That being said, it was far from perfect in search-land with (yet another) Mr. Superstar candidate for a very senior position we have been working on. This genius just knew no boundaries and evidently determined that one is better off shouting to make a point. And I do mean shouting. He did not understand the concept of listening. And to be candid, I have no idea how this guy made it to the bonus round and was still in contention before Santa showed up. The operative word here is “WAS”. Maybe it was the holidays – my client probably did not want to dampen his spirits and take away from his holiday cheer. But me? Actually, I had no problem with the concept at all. None. True, on paper this guy was “the guy”. Rock star status. And when I engage in a search, I seek out the best talent in the land. But unfortunately, once “that guy” opened his mouth at the interview… everything changed. He interrupted my client and literally shouted over his voice to make meaningless points along the way. And then after each loud (and long) outburst, he always followed up with, “Are you with me“? Oh yeah – I’m with you. My client never had a chance to ask this true-winner-in-the-game-of-life a meaningful question – as there was no air left in the room. Never. So, my New Year’s resolution? Okay, one of my resolutions – is to avoid working with idiots. That’s right. 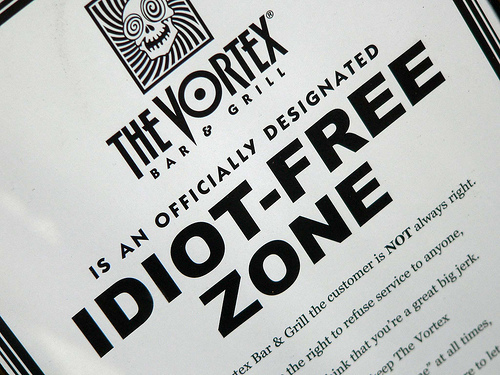 A NO IDIOT RULE. Yeah. I like that! In this competitive job market, candidates need to stop between each question, gather their thoughts, pivot, answer the question and then shut up. It’s not that hard. Really!